If crowds indeed mean votes then Amama Mbabazi’s political team can be pleased with their first political field test in Mbale today. From what seemed like ill preparations from the onset, Mbabazi’s team can take consolation from the big crowds that welcomed their candidate. On arrival at Pretoria Hotel at about 12:20pm, Mbabazi was sandwiched by his supporters who asked him not to proceed to the meeting hall saying all those waiting for him were loyalists of the incumbent President Yoweri Museveni. Mbabazi pleaded with the supporters to let him attend the consultative meeting with mobilisers, opinion, cultural and religious leaders for at least 10 minutes so he could proceed to a public rally at the Cricket grounds. “I thank you for welcoming me in such big numbers. I have never been welcomed like this”, he said. 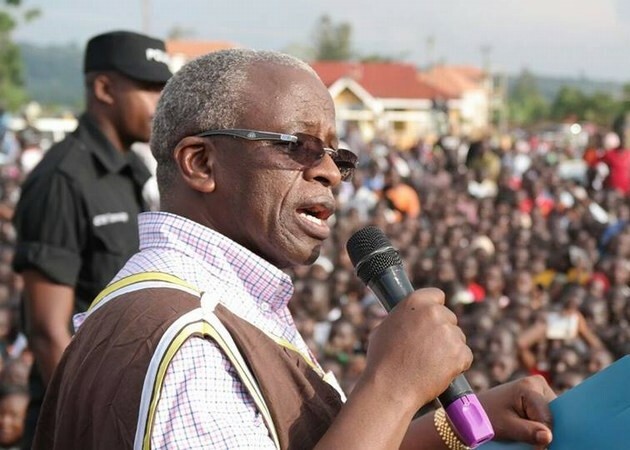 Crowds in Mbale waiting for Amama Mbabazi at Cricket Grounds, His team advised to have the meeting postponed to a later in the day for fear that police would block will not allow the public rally to take place late in the evening. Enroute to the Cricket grounds police attempted to block Mbabazi’s convoy which was now followed by a large crowd from using Bishop Wasike road but for fear disrupting traffic in Mbale town. In defiance, Mbabazi refused to use the alternative route of Tororo road and decided to walk to the Cricket grounds with his supporters. The supporters forced their way through police barricades that included water tankers, police trucks, heaps of soil among others. Addressing the rally, Mbabazi said he chose to start with Mbale because because of “its historical contribution in our struggles in liberation of not only Uganda but also East Africa”. He also mocked the police for having blocked his convoy and instead forcing him to walk and “see the true picture and state of Mbale town”. 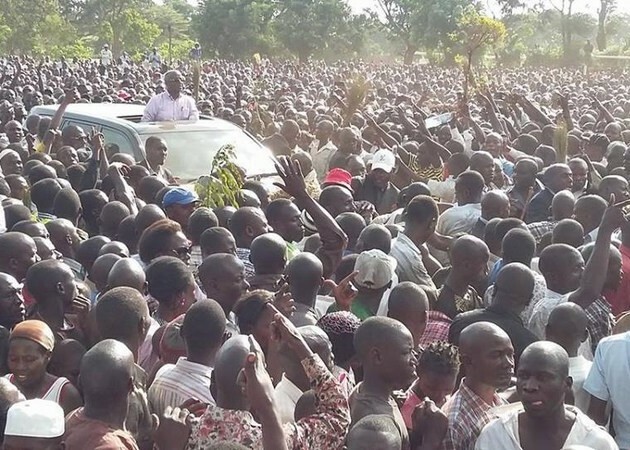 He promised Mbale residents that if elected, he is going to “restore and transform the town back to its glory” when it was known as the cleanest town in Uganda, East Africa and among the best in Africa. On peace and stability, Mbabazi said it is currently an “illusion” and that the NRM achievements in the last 30 years – are all at risk because the country is headed towards another bloodshed similar to the one that ushered in this government in 1986. He is expected in Kapchorwa tomorrow.